The 36th running of the Grade I $1,000,000 Arlington Million drew a field of 11 entrants for the 1¼-mile turf event at Arlington International Racecourse. Chicago's marquee race attracted a bevy of worldly talent, but Amerman Racing Stables' Oscar Performance, victorious in last season's Grade I Secretariat, will star from stage right when they break from the gate on Saturday, Aug. 11. The winner of the Arlington Million, a “Win and You're In” event, will receive an automatic berth into the Grade I $4,000,000 Longines Breeders' Cup Turf at Churchill Downs on Nov. 3. Trained by Brian Lynch, the multiple graded stakes-winning son of Kitten's Joy will look to become just the fifth horse to complete the Secretariat-Million double. A three-time Grade I winner over the grass, Oscar Performance tops the Million field in career earnings with $1,967,632. The 4-year-old colt will break from post 11 under Jose Ortiz. Aidan O'Brien will look to capture the coveted Million trophy for a third time in his career. The Ballydoyle-based conditioner will saddle Mrs. Fitri Hay, Mrs. John Magnier, Michael B. Tabor and Derrick Smith's Deauville (IRE) following close third-place finishes for the son of Galileo (IRE) in the past two editions of the Million. The 5-year-old draws in post nine under Ryan Moore. Shadwell Stable's Almanaar (GB), Al Shahania Stud's Money Multiplier and Convento Viejo's Robert Bruce (CHI), all hailing from the barn of last year's winning conditioner Chad Brown, will be on target to give the trainer back-to-back victories in the Million. Almanaar, a 6-year-old gelded son of Dubawi, joined Brown's stable in 2016 following a pair of Group 3 victories in France. 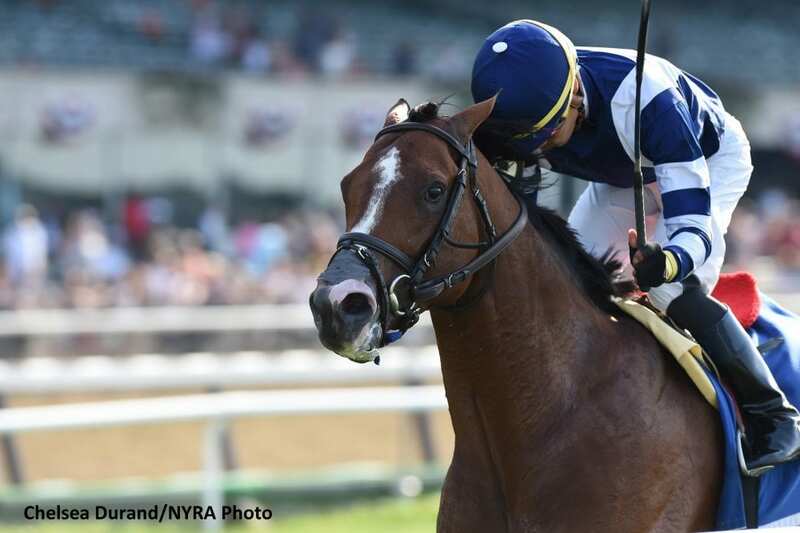 He returned from a lengthy spell in June to fire off a win on the Belmont turf over graded stakes winner Ticonderoga. Joel Rosario will ride from post three. Money Multiplier enters the Million off a half-length loss in the Grade I United Nations at Monmouth Park in June. The 6-year-old son of Looking At Lucky traveled to Qatar in February to finish third in the Group 1 Emirs Trophy before returning stateside to land a win in the Grade II Monmouth Handicap by three-quarters of a length over Million-competitor Divisidero. John Velazquez will be in the irons as the duo breaks from post eight. Robert Bruce was undefeated until a troubled trip in the Grade I Manhattan Handicap cost the 4-year-old son of Fast Company (IRE) a placing and a perfect record. A four-time group winner in his native country, he captured the Grade III Fort Marcy Stakes at Belmont Park in his North American debut on May 5 over fellow Million contender Spring Quality. Irad Ortiz, Jr. will pilot the Chilean-bred colt from gate ten. Winner of the Grade I Manhattan for Augustin Stable in June, Spring Quality will look to land trainer Graham Motion his first victory in the Million. The 4-year-old son of Quality Road defeated three Grade I winners when making his second start of the season in the Manhattan. Hall of Fame jockey Edgar Prado has the mount from gate two. Gunpowder Farms' Grade III Arlington Handicap winner Divisidero returns to the Million after a seventh-place finish in the 35th running. Now in the barn of conditioner Kelly Rubley, the 6-year-old son of Kitten's Joy looks to rise to his previous Grade I-winning form that helped him capture back-to-back Woodford Reserve Turf Classics at Churchill Downs on the Kentucky Derby undercard in 2016 and 2017. Jevian Toledo retains the mount as the pair draws in gate four. Naipaul Chatterpaul saddles Grade III Stars and Stripes winner Catcho En Die (ARG) while chasing his second Grade I victory as a trainer. Owned by Chatterpaul in partnership with Sotirios Sakatis, the 6-year-old son of Catcher In The Rye (IRE) was a Group 1 winner in his native country before traveling to the United States, where he was claimed by Chatterpaul for $40,000 in April of this year. Catcho En Die gets the services of Arlington's current leading rider Jose Valdivia, Jr. from post six. The local connections of Midwest Thoroughbreds and Roger Brueggemann captured the 2015 Arlington Million in historical fashion with the first Illinois-bred winner in The Pizza Man. They team up again this season with a 5-year-old son of City Zip, Twenty Four Seven. The five-time winner was restless in the paddock prior to his sixth-place finish in the Grade III Arlington Handicap last out but finished just two lengths behind winner Divisidero. Local rider Chris Emigh will be aboard as the duo break from post seven. Rabbah Bloodstock's Century Dream (IRE) brings trainer Simon Crisford stateside to saddle just his second North American starter. The 4-year-old son of Cape Cross (IRE) won the Group 3 Investec Diamond Stakes at Epsom in June before a narrow loss by three-quarters of a length in the Group 1 Queen Anne at Royal Ascot. William Buick was aboard for both those starts and returns to ride the colt from gate five. Circus Couture (IRE) will be making his fourth start for conditioner Jane Chapple-Hyam, who has owned the 6-year-old son of Intikhab since February in partnership with Bryan Hirst. A nine-time winner in Italy for trainer Marco Botti, Circus Couture has hit the board in six of his seven career starts at the mile-and-a-quarter distance. Jockey John Egan will navigate the Irish-bred from the rail over the Chicagoland oval. NBCSN will broadcast live from Arlington International Racecourse on Saturday, Aug. 11 with racing coverage beginning at 5:00 pm CDT. The 12-race card begins with a first post of 12:15 pm. The Arlington Million lands as the penultimate race on the card, with an approximate post time of 6:10 pm CDT. This entry was posted in Breeders' Cup, NL Article and tagged almanaar, Arlington International, arlington million, breeders' cup turf, brian lynch, Deauville, money multiplier, oscar performance, robert bruce, secretariat stakes, win and you're in by Press Release. Bookmark the permalink.